In April 1935, the Council of Labor and Defense (STO) passed a resolution No.-41сс “plan for the development of the air forces of the red army in 1935 – 1937,” according to which was to increase aircrew to 25 thousand people. And this meant that their training will require new training aircraft. Especially bombers, since it was expected that training the bombers will significantly reduce the consumption of fuels and lubricants and the cost of training of pilots and navigators. To this end, several design Bureau has deployed the relevant work. Not spared this trend and the staff of A. S. Yakovlev, where in 1937 started to design the triple aircraft UT-3 (air-17, C-17, or No. 17) with two French 220-horsepower motors Renault 6Q-01 “Bengali” and a metal two-bladed variable-pitch propellers rat’e. The production of these engines was utilized in the Soviet Union under license under the designation MV-6. The airplane was designed in accordance with the requirements of the customer, placing the crew as high-speed bomber SB: in front of the cabin – the Navigator with a machine gun ShKAS, followed by the pilot in the rear cockpit -gunner with a machine gun ShKAS. In the export version of the aircraft in front of the cabin, as for learning CSS, was the pilot-the instructor, which was provided for the second control: the steering wheel and folding pedals. But the designers did not stop and for greater similarity with ABOUT the used units of the control flaps. In the cargo Bay provided a cassette bomb racks Der-21 for the suspension as practical (P-40) and high explosive (FAB-50 or FAB-100) bombs. 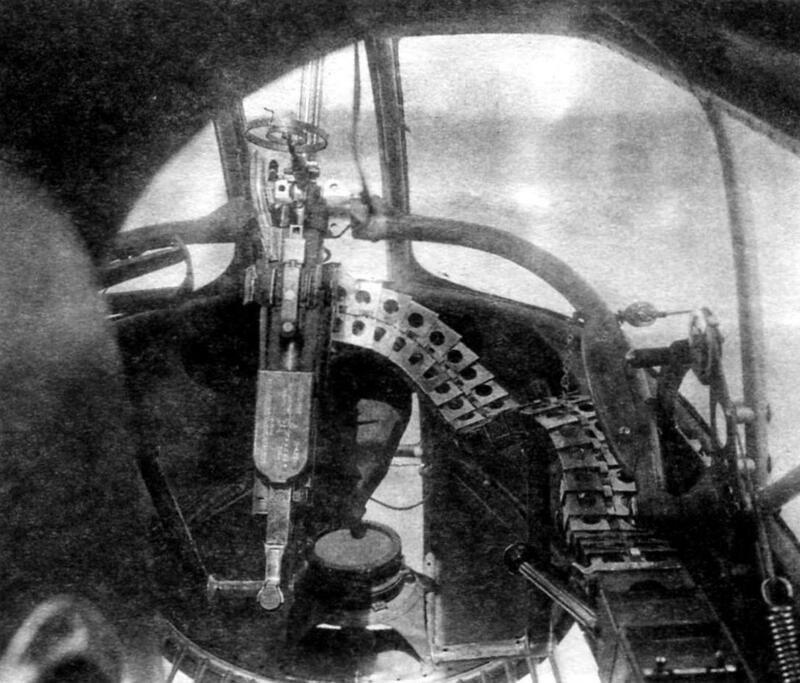 In addition, provided but not mounted defensive armament of two ShKAS machine guns in the Navigator (in front cockpit) and an arrow in the rear cockpit on the turret TUR-8. The first model brought to the factory test with a ski undercarriage in the spring of 1938. The leading pilot was Yu. I. Piontkovsky, who performed 52 flight with a total duration of 11 hours. Then the car returned to the factory for elimination of the revealed defects and installation of scheduled equipment. Revision was delayed and the aircraft presented at the air force Institute only may 15. Leading in the first stage of state tests was pilot M. A. Aitkin and Navigator A. M. Brahinsky. Although the aircraft flying qualities and behavior in all modes of flight and landing was close to SB, it has revealed many shortcomings. In particular, in some modes there was vibration in the tail. The military wished to install on the wheel brakes. Had a claim to the weapons. All this ought to eliminate it promptly. In addition, the flight may 28 ended with an accident that terminated the test. On takeoff, when the machine was at a height of not more than 30 meters, collapsed right French the screw. Detached the blade passed clean through the front cockpit, hitting Kok propeller of the left engine. However, nothing happened. Pilot A. M. hripkov, turning 90°, landed along the border of the airfield. Since the program of state tests by that time was almost completed, and the results generally satisfied the customer, the car was sent for polishing. Thus the increased stiffness of the fuselage, increasing the diameter of the pipe truss frame and replacing the wire stretching steel tapes. At the same time the air-hydraulic lift system and the landing gear was replaced by electro-hydraulic-type aircraft SB and put wood screws, changing the hoods of the motors. “1. The aircraft can be applied in line units the air force as a transitional issue for pilots and training during the course of combat training. 3. Simplicity of design and low-power motors provide low cost aircraft in mass production and economy of operation. 4. A big run-up (440 m) and long exposure resulting wooden <…> and also heavy screws require airports with not less than 1500×1500 m and with good approaches. 6. 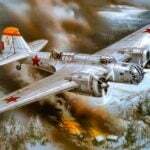 Bomber and small arms is consistent with the purpose of the aircraft…”. 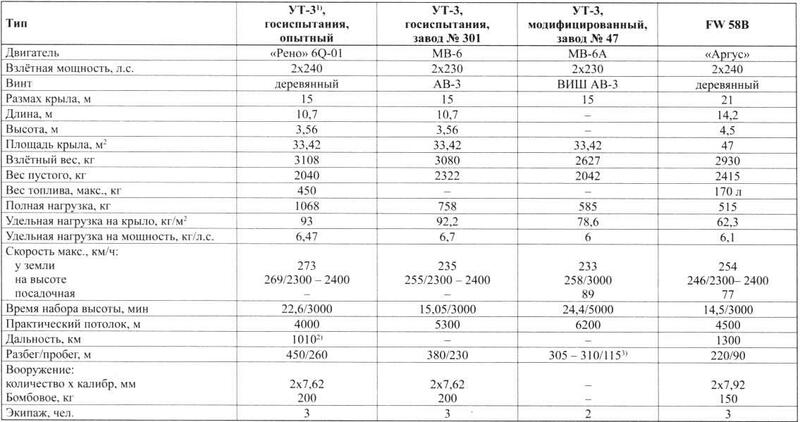 At the end of the report on results of state tests said, “Training twin-engine bomber engineer T. Yakovleva <…> considered passed the state test. It is also necessary to prepare the aircraft for release from his high-rise motors Renault and propellers variable pitch in flight of domestic production. # 115 you must correct all the deficiencies noted, according to the defect”. The car passed the second stage of state tests and, as follows from the report according to their results, could find application in the combat air force units as a transitional machine for the training of pilots of high-speed bombers and training of flight crews. In addition, it is possible to prepare navigators and gunners-radio operators. The decision of Committee of Defense were instructed to release the first batch of ten UT-3 on 1 September 1939. Since all documentation on the car had to be adapted for technological processes of the plant № 81, the first car left the Assembly hall with a delay of three days. Also had imported the engines to replace the heavier Soviet MV-6, built under license, with variable-pitch propellers AB-3. Given that the need for training the bomber was very high, then followed by factory No. 81 to the release of the UT-3 connected enterprise No. 301 in Khimki near Moscow. However the plant number 81 and have not built any cars and all the snap and hurt transferred to Khimki. The first aircraft plant № 301 built 1 September 1939, and after debugging and factory testing it was transferred to NII VVS. But their results are not pleasing. The machine is not only much heavier, and its dangerous alignment has shifted back to 33 percent. Had to abandon the radio station and camera AFA-3, provided on production machines. In addition, shifted the engines forward, but it was not enough. In early 1940 at NII VVS (the leading engineer Turkov and the pilot I. S. Stadnik investigated the stability and handling first copy of the aircraft factory No. 301, but they were disappointing. As a result, in the opinion of the test pilot P. M. Stefanovsky, “the plane has deteriorated significantly in relation to piloting…. Compared to combat production aircraft, nothing in the technique of piloting is not… Due to peretyagina design, poor stability, poor takeoff qualities, difficulties in piloting, the lack of similarity in the piloting of combat aircraft, aircraft UT-3 as a training of no interest”. Testing and debugging of serial machines lasted for a long time, but to get the desired result failed. In all there were 11 aircraft. Note. 1. The tests were conducted with flight weight of 2900 kg. 2. Technical. 3. With flaps and brakes. To solve the problem with the learning machine bought three samples of the FW 58 similar purpose in Germany and even borrowed from it some technical solutions. FW 58V, equipped with small and bomber weapons, intended for training of navigators and air gunners, and the double variant of the FW 58С for training pilots. This latest version of “Focke-Wulf” was the reason for changing the concept of training of the bomber that turned into a regular double TCB. In connection with the transfer of the factory in Khimki for the manufacture of the Yak-1, all the groundwork and documentation for UT-3 was transferred to the Leningrad plant No. 47 and sent as chief designer E. G. Adler. In the manufacture of the lead car (n 01147) while in the triple option, taking into account the wishes of the customer, changing the front glazing of the cockpit. Her first flight took place on 30 July (pilot F. Mokin) but he was unsuccessful. As the emergency act, the airplane at takeoff was hooked wheels ground shaft for Lithuanian channel. Moving the ORE forward, the pilot inadvertently gave the helm myself, and the car, lowering the nose, hit the chassis on the ground. However, the pilot, unaware of the destruction of the chassis, made a circle over the airfield and landed. Radio communication with the plane was not there, as there was binocular at the head of the fly to see the degree of destruction of the chassis. In the end, the flight ended in a serious car crash and injury of the pilot. After recovery of the aircraft testing continued, but the trouble is, as a dragon, and in December 1940, while landing on the powdery snow, the plane was escapetravel. What is the fate of this machine is unknown, but the customer didn’t give it and it can be assumed that the aircraft remained unclaimed, “living” their days in the Parking lot. Moreover, to test out a modified double version of UT-3. In the new car, designated as the C-17, little remains from its predecessor. So, the crew was reduced from three to two, placing the seat UCITA (trainee) in front and the instructor behind him in the common cabin. The machine has reduced the volume of fuel tanks, removed all the weapons. Chassis with wheels size 600×180 mm made fixed gear with the increased speed of the damper main landing (up to 300 mm instead of 110 mm) and lengthened engine mounts (150 mm). Set the other crutch is oriented at 360° C has been increased by 70 mm stroke of the shock absorber. All this together helped to shift the centre of gravity of the car forward from 27.63% to 23.8% mean aerodynamic chord (SAH). The wing is installed at an angle of +3° is zero, and the stabilizer angle of +2° instead of 30′. In addition, the car was equipped with motors MV-6A with a record of R-2 to automatically adjust the angles of the blades of the propellers AB-3. Put a new vodoradiatory with a diameter of 150 mm instead of 100 mm Entrance hole of the tunnel air inlet, ohlajdauche motors, increased, and the blinds on the output slit hood made adjustable. Flaps become solid, and their area increased. Now they can deviate by an angle of 36° instead of 50° of its predecessors on landing and take-off by 14°, which was not there before. Control flaps were carried out using a pneumatic actuator is electro-hydraulic. At the same time changed the design of the pedals, making them adjustable to suit the height of the pilot. “Aircraft modified UT-3 WW2-6A meets the requirements for training to the transitional twin-engine aircraft for its flight properties <…> the monoplane scheme, the presence of screw-machines, landing flaps, brake wheel, rudder trim height and rotation and placement of a student and instructor under one common lantern /providing a direct link between them/”. of the fuselage, setting the lantern new design, expanding the cockpit of 300 mm, moving the rear seat forward by 250 mm.” But this, as well as serial production of cars was disrupted by the war. As follows from the Act on the reception and delivery of Affairs the air force Institute of may 24, 1941, the leadership of the Institute demanded on UT-3 to equip it small and bomber weapons, and radio equipment almost completely analogous to the plane SC, that was “totally pointless and only led to eretailing, deterioration of flying qualities and withdrawal from the production of desperately needed air force twin-engine training aircraft”. It is impossible not to agree, because in this case the military too much wanted to get from the plane with low-power motors. C-17, compared with the German FW 58, were only allowed to train future pilots and navigators-navigators. As for individual bombing, the experience of the great Patriotic war showed that this craft was a lot of navigators regiments and squadrons, the rest had only to press the button of the release gear for the team lead. 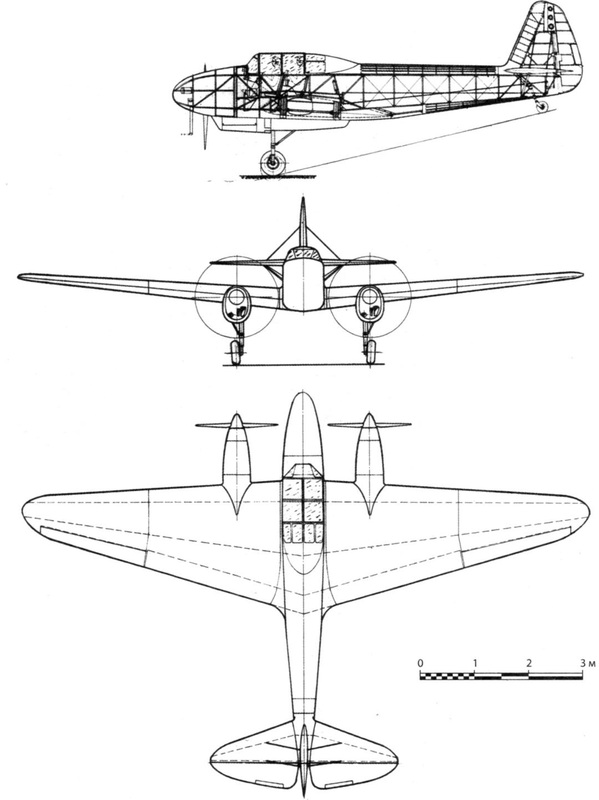 Due to insufficient thrust-UT-3, was studied variant of the plane Etalon 1941 with the replacement of the CF-6 nine 300-horsepower engine air-cooled MG-31F. But these motors have failed. 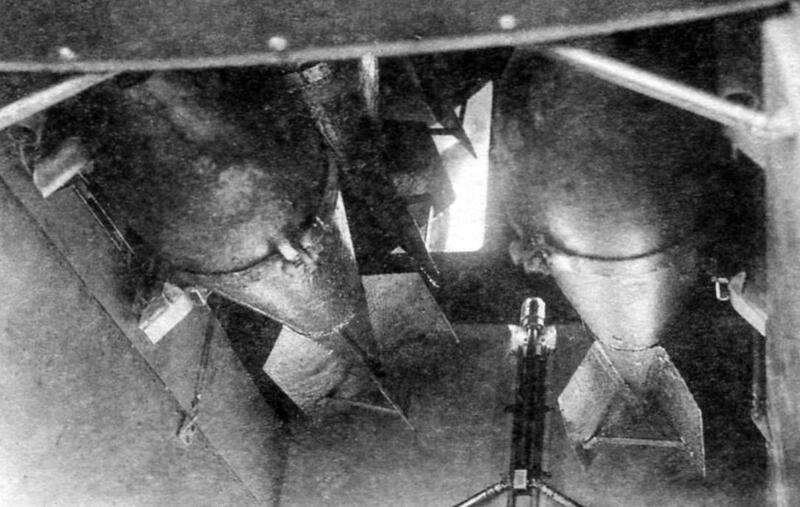 The initiative was studied variant of the UT-3 with a two-keel fins, but it remained on paper. In 1940, the plant number 81 has made one, and No. 301 – eleven UT-3. On 20 September of the same year, the air force was listed as nine serial UT-3, of which two cars were on the test. At that time, four aircraft were in serviceable condition, and five required a current repair. In addition, two UT-3 were listed in naval aviation. As for the engines, CF-6, they made 75 copies. The last eight motors the customer handed over in 1941, but they never found wide applications in domestic aviation. In fairness it should be noted that none of the developed in the Soviet Union of training aircraft has not been received in the air force. And among them were training aircraft V. K. Gribovsky and V. V. Nikitin. But for various reasons they remained in the category of experienced. As the German FW 58, designers have attempted to make the UT-3 multi-purpose, turning it to start in the passenger and sanitary. So there was a five-seater plane No. 19, developed under the leadership of O. K. Antonov and intended for local airlines.